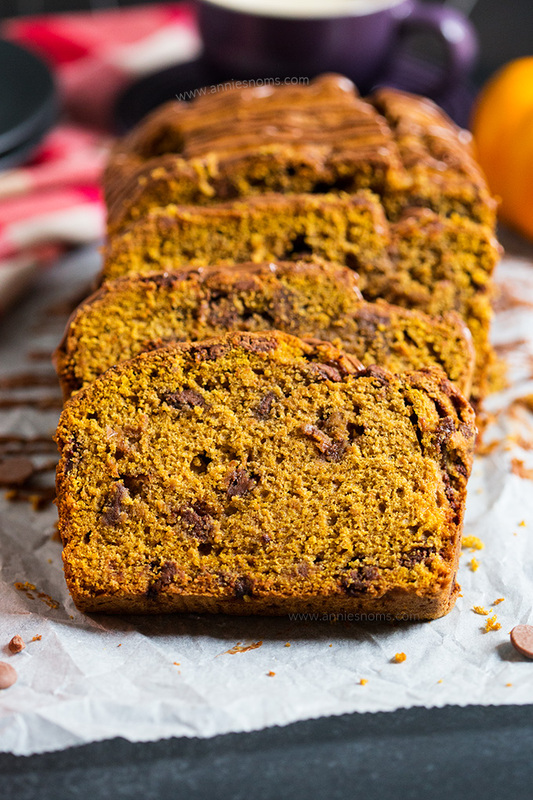 This easy to make Pumpkin Chocolate Chip Bread is spicy, sweet and filled with gooey chocolate chips. Perfect for coffee breaks, breakfast or dessert, you’ll make this bread again and again! Well, hello there. How has your week been? Glad to report that this week has been much less stressful than last week. We have made said big, scary, exciting decision and we’re now moving ahead with it. We’re still in the planning stage, so nothing to actually report yet, but rest assured I will be documenting this process when things start happening. 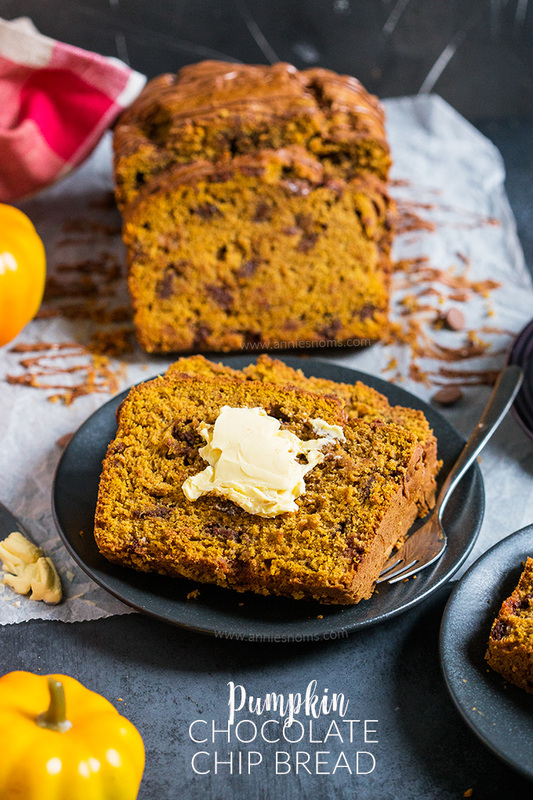 Today, we are saying goodbye to pumpkin season with this Pumpkin Chocolate Chip Bread. This is my favourite pumpkin bread ever, it’s got the perfect crumb, texture and flavour and then I added in heaps of chocolate chips to really ramp it up. It never ceases to amazing me how simple ingredients can make such fabulous things. Quick breads are easy to make and the kind of recipes where you can bung everything into a big bowl and beat it until it’s combined. They’re kind of fool proof, yet they always turn out to be amazing. 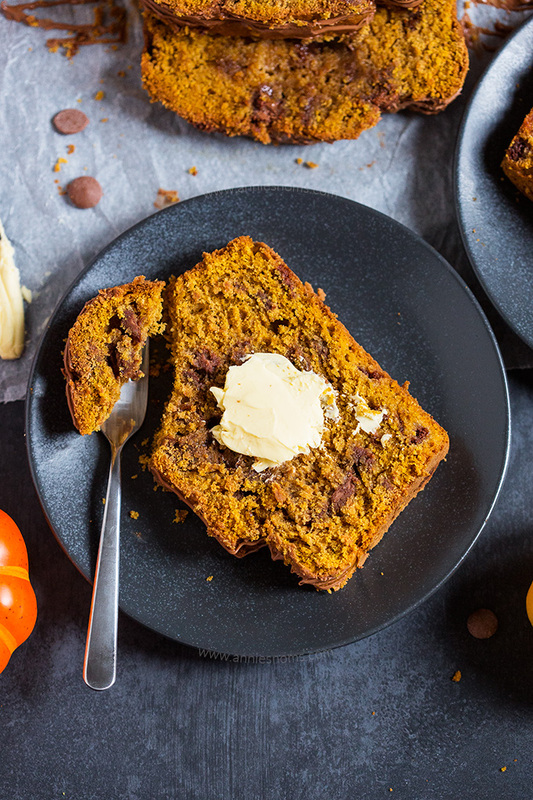 There are quite a few ways to enjoy this Pumpkin Chocolate Chip Bread; warm from the oven, at room temperature, slathered in butter, warmed and slathered in melty butter, slathered in chocolate spread. The options are endless! My favourite way to enjoy this bread? Warm with melty butter. Oh my word, so good it should be illegal! This bread is definitely the perfect way to wave goodbye to pumpkin season for another year. Next week I’ll be starting with all my Christmas recipes…. how is it almost Christmas?! I’m in denial that it’s so close. I haven’t bought one single present, I haven’t even thought about what to get anyone. Normally I’m super organised, but this year there’s so much going on that I haven’t really had time to get excited or think about it. Are you guys ready for Christmas? Anyone completely done with present buying and all wrapped? Hats off to you if you are, I really need to pull my finger out and start next week! It’s certainly easier now I’ve cut down on who I buy for. I’m not someone who will buy stuff because it’s expected or just for the sake of it. If we have nothing to do with each other, why would I get you a gift? I am into thoughtful gift giving for people I genuinely like. I always spend so long thinking of what to buy or make for my loved ones. I never want them to think I’m just buying tat just so I have something to give. Unfortunately, that thought is not reciprocated by everyone in my life. It just annoys me when you can clearly tell the person put no thought in, they just did it so they can say they gave a gift. I’m not a materialistic person, so I’d rather no present than something so genuinely thoughtless. Do you want an example? Someone close to me gave me earrings last year… I haven’t had my ears pierced since 2001. And this person also said that they have no idea what they give people, they just go into a drawer and grab any old thing. Honestly? I’d rather they didn’t bother. I don’t want or need anything. I much prefer just getting to spend time with my loved ones over the holidays. Christmas is the only time my Dad actually gets a day off, so I just like going to my parents and getting to spend time with my family and sharing good food and laughs. Anyway, I hope you enjoy this delicious pumpkin bread and I’ll be back next week with Christmas recipes! 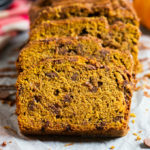 This easy to make Pumpkin Chocolate Chip Bread is spicy, sweet and filled with gooey chocolate chips. Perfect for coffee breaks, breakfast or dessert, you'll make this bread again and again! Preheat the oven to 180C/350F and spray a 2lb loaf tin with cooking spray. Lay a thin strip of grease proof paper long ways in the tin, with some overhang each end to lift the cake out. Place the butter and sugars in to a large bowl, or the bowl of your stand mixer, and beat on medium-high speed until light and fluffy. Around 2 minutes. Add in the eggs, scraping down the sides as necessary, and mix on medium speed until well combined. 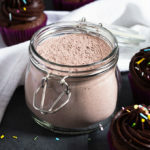 Place the flour, baking powder, bicarbonate of soda, salt, spices and chocolate chips into a medium sized bowl and stir briefly to coat the chips in flour. Tip the flour mixture into your egg mixture and mix on low until the mixture starts to come together, then add in the pumpkin and continue to mix on low until combined. Tun the speed up to medium and mix for 20-30 seconds to make sure everything is smooth and combined. Tip the mixture into your prepared pan and spread into an even layer. Place in the oven for 40-45 minutes, until risen, golden and an inserted skewer into the centre comes out clean. There should be no orange crumbs, but you may hit chocolate chips and have them on your skewer! Leave to cool completely in the pan, before transferring to a cutting board to cut into 10-12 slices. 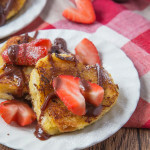 Alternatively, you can remove the loaf and drizzle some melted milk chocolate over the top like I did. Leave it for 15 minutes to set and then slice. Pumpkin Chocolate Chip Bread will keep in an airtight container, at room temperature, for 5 days. 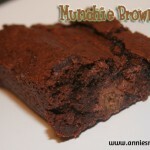 You can serve it at room temperature or warmed for 30 seconds in the microwave with butter. I love pumpkin bread! 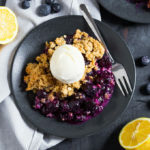 Looks so delicious and perfect for Fall! 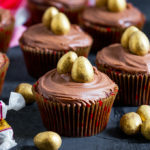 Great fall recipe, looks so appealing with chocolate and butter! 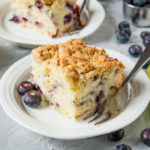 This looks like a great little dish to bring to Thanksgiving! Thanks! I’m not usually a big fan of pumpkin but I LOVE Pumpkin Chocolate Chip anything!! This bread is perfect! I have a son who loves all things pumpkin. He will be in love! 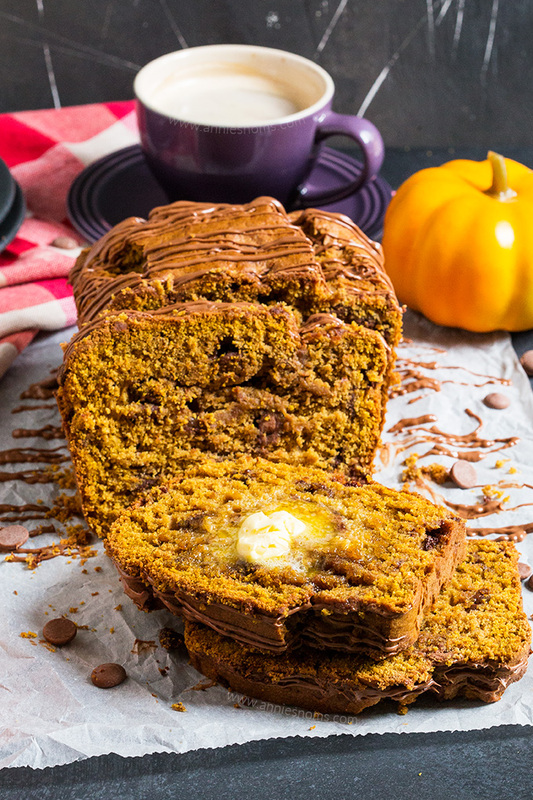 We love Chocolate Chips in everything… This Pumpkin bread is an amazing fall recipe.. 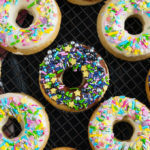 The way that butter is melting on top of that slice — oh my! So mouth-watering. This would be so brilliant with my morning (or afternnon!) coffee.